Carey Mclean (front, right) will take a one-stroke lead into the final round of the Junior Women's Championship. 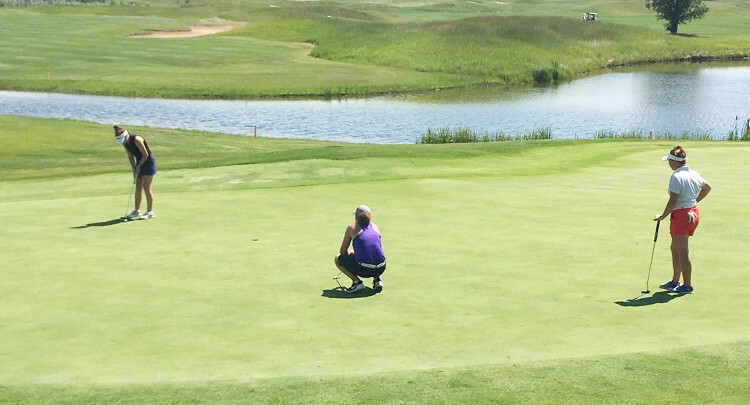 Carey Mclean was a stroke off the pace at the Saskatchewan Junior Women’s Championship on Monday, the Deer Valley golfer has swapped positions and leads the pack into Wednesday’s final round. Mclean, 16, shot 84 during the opening round of the tournament at the Moon Lake Golf and Country Club, one more than Brooklin Fry of Shell Lake. On Tuesday during the second round, Mclean improved with an 81, Fry, 13, carded an 83 for the second straight day. Mclean’s card was tidy, four bogeys scatted the front nine, another four bogeys littered the back. She managed a birdie washing out a lone double-bogey on hole 11. Squeezed in the middle of the two is 12-year-old Ella Kozak, the Yorkton product posted the day’s low round at 78, ten strokes better than her opening round of 88. Sarah Grieve of Saskatoon sits at 171 (87, 84) for the tournament, six strokes back of Mclean and four behind both Kozak and Fry. Lauren Fox rounds out the top-five at plus-28, with back-to-back rounds of 86. The complete championship results can be seen here. The championship’s final round will begin at 7:30 a.m.